Steven’s work explores the tension and coexistence of nature and the man-made. Photographic images are layered and juxtaposed to stage surreal, cinematic scenes rich in possibilities of interpretation: dream-like, elegiac and contemplative. The artist often depicts objects that have rusted – a contemporary motif of decay and mortality. When Cities Were Forests has been inspired by recent visits to cities. City skylines have been modified and arranged to create abstracted scenes which consider the evolution of urban spaces. The work explores the effects of climate change on large city conurbations. Neon Desert is inspired by travelling through California and Nevada, experiencing the conflict of natural and constructed environments. Urban Tribe explores man’s relationship with the urban landscape. 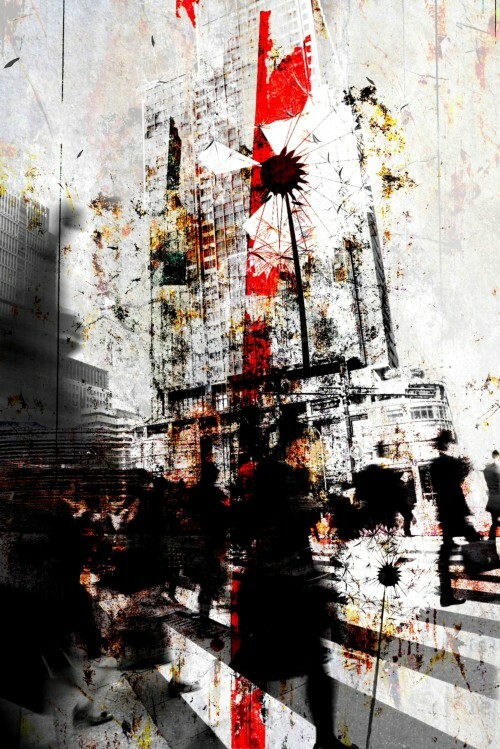 Images are produced by using both analogue and digital techniques, from scratched negatives and chemical staining to digital layering and blending, each created to form a unique and stylised image.